In a Condition Monitoring program the condition of your machinery is periodically monitored, while they are running normally. Van Geffen VMS offers monitoring programs based on periodical spectrum analysis combined with trend analysis. This approach enables us to detect wear or damage in an early stage after which its progression can be followed. A clear and concrete recommendation will tell you which precautions to take and how long your machine is able to run safely. Recommendations that enable you to plan and perform specific maintenance actions. 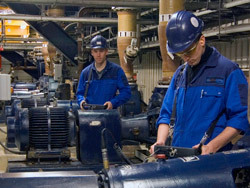 An optimized condition monitoring program will therefore also prevent unplanned downtime. A trend analysis can, in some cases, provide an indication of a changing condition over a certain period of time. However a trend analysis alone may never be leading for a strict recommendation about the maintenance of your installation. Eg. a damaged bearing will barely cause an increase in overall levels. For a reliable maintenance program spectrum analysis are necessary and should never be missing in a Condition Monitoring Program. How often should the measurements be performed? A frequently asked question, the answer however is not that definite. Factors as load, speed, temperature and pollution are all determining the rate of wear. Besides that it is also important if a machine is critical to the process or what the consequences are when the machine fails. All these factors together determine the measurement frequency. In general a measurement interval of roughly 3 months is used. There are however many examples where this period has been shortened to monthly or even weekly measurements. For critical (turbo)machinery it is also possible to choose for continues monitoring with a permanently installed monitoring system.